Maximum size: 12 mm (excluding "tail"). Identification: This cryptic species is usually brown mottled in cream with orange highlights. Most animals have a "W-shaped" cream mark on the head, a cream patch on the posterior tip of the head shield and five orange spots on the front of the head. However, young animals vary considerably in color with some having uniformly distributed orange spots or blue lines reminiscent of Chelidonura hirundinina. The latter still show the five orange spots on the front of the head and the cream posterior tip on the head shield characteristic of Biuve cf. fulvipunctata. They also have an orange line in the center of the notum in contrast to the blue line in C. hirundinina. The white "W" may be interrupted medially in young animals and the length of the "tail" is variable. Natural history: Biuve cf. fulvipunctata is a common nocturnal species found in protected to highly exposed locations. It occurs in rocky habitats at depths of 1-6 m (3-20 ft) and (occasionally) in Halimeda kanaloana beds at up to 12 m (40 ft). It probably feeds on small acoelomate flatworms and has been observed "striking" (though ultimately rejecting) Convolutriloba longifissura (Note 1) Kay (1979) states that it can be found among the stipes of Boodlea and Jania during the day. A fringe of sensory hairs at the front of the head is used to detect prey. In dishes, its egg masses are small, irregular white clumps composed of an irregular string. However, it is likely that they remain sack-like when laid in the field where their sticky surfaces can collect detritus for reinforcement. Hatching occurs in about four days in the laboratory. Distribution: Big Island, Maui, Oahu, Kauai and French Frigate Shoals. Taxonomic notes: This is the species listed as Chelidonura amoea Bergh, 1905 in Kay, 1979. It was first recorded in Hawaii from Kaneohe Bay, Oahu by Terry Gosliner in May, 1973. The Hawaiian population is probably different from the wide-spread Indo-Pacific form formerly included with it under the name Chelidonura fulvipunctata. (Zamora-Silva & Malaquias, 2017) The animals with relatively large orange spots extending onto the foot (see photo) are more common in the Western Pacific and show some sign of intergrading with mottled forms in that region. So, there's a chance that they might represent the Indo-Pacific form. Some sources use Aglaja fulvipunctata for that species. 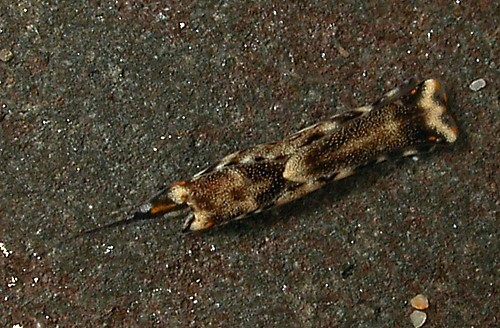 Photo: CP: 4.6 mm: Hekili Point, Maui; March 30, 2006. Note 1: Several times in 1998 6-8 mm animals were placed in dishes with 1.5-2 mm specimens of Convolutriloba longifissura (tentatively listed by Poulter as Convoluta sp. in section two of Reef and Shore Fauna of Hawaii, 1987). On contact with their sensory hairs, the worms were "inhaled" with a speed comparable to the feeding strike of a scorpion fish, e. g., much too fast to make out any details of the movement. Whether the worm is "on the menu" normally is still open to question, however, since (in all cases) its crushed remains were regurgitated about 15-20 seconds after it was taken. It may be close enough to their normal prey to trigger their feeding reflex but proves unpalatable after ingestion (perhaps, due to a defensive chemical?). When offered a second species of 2 mm worm on a later occasion, they showed no response.